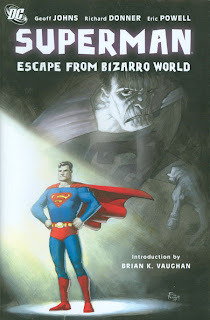 Eric Powell makes Superman: Escape from Bizarro World something to behold. From the zombie Bizarros on just the introductory pages, struggling en masse to be the first to ravage Superman, crawling over one another and even sticking fingers in each others' eyes in their mad rush, this book portrays Bizarro in a mad and hideous glory rarely seen before. Escape from Bizarro World itself is just three issues (rounded out by some classic Bizarro tales) and the plot itself doesn't cover much ground that other writers haven't touched previously, but it's a worthwhile experience nonetheless. As with Superman: Last Son, Geoff Johns writes here a fully accessible Superman story. The Man of Steel gets called to Smallville when Bizarro kidnaps Pa Kent; in short order, Superman arrives on the new Bizarro World, where he finds a society of Bizarros turned against "Bizarro #1," who believes that only Pa Kent can help him make it right. This is a current Superman story, following from Bizarro's appearance in Last Son, but it uses only the most easily recognizable Superman characters. Any casual Superman television or movie fan would have no trouble grounding themselves in this tale in short order. At the same time, Super-comics fan may find Johns' limited use of Superman's wider supporting cast a little simplistic; I'm not sure we've found a happy balance yet between Johns sticking with just Lois, Perry, and Jimmy in Action Comics, and writer Kurt Busiek's somewhat awkward use of Subjekt-13, Lana Lang, and Jenet Klyburn in Superman. Johns writes a most effective Pa Kent here, flashing back to scenes from Clark Kent's youth where, unable to play with normal kids for fear of hurting them, Pa did his best to act as a substitute friend for his son. In the bizarre parallels between Superman and Bizarro, we also see parallels between Superman's two fathers--Superman to the holographic head of Jor-El to get advice as to how to defeat Bizarro, while Bizarro kidnaps Pa Kent for help when the Bizarro population rejects him. Even as Superman wants to abandon Bizarro, it's Pa Kent who perhaps sees some of young Clark in Bizarro, and explains to Bizarro how his super-powers come with the responsibility for caring for his (square-shaped) planet. As an aside, I'm a bit disappointed with what the tone of these stories suggest--if foreshadowing here and in Last Son is to be believed--that Johns intends to do away with Pa Kent (no spoilers, please). Yes, I understand how Pa's death functions in Superman: The Movie and in Smallville as a way of making Clark his own man--but the comics-Superman has lived so long with Pa alive that I hardly see how it turns the story. Johns's big contribution to the Superman mythos so far has been the floating Jor-El head (that offers a heck of a deus ex machina in a ready-made spaceship here, though cute, Eric Powell, that this resembles an early-1980s Superman Corgi toy)--killing Pa while keeping Jor-El's hologram only reinforces Superman's alienation, when the whole point is that he's adopted humanity, people, not that he's an alien! As well as Pa comes off in this story, I just can't see the logic in getting rid of him. Escape from Bizarro World, as I mentioned, doesn't cover much new Bizarro ground. Aside from Bizarro's new Bizarro-generating "Bizarro vision," the Bizarro World is still square and the inhabitants still talk backward. Where Bizarro World gets clever is when Johns begins to examine some of the ridiculous society's subtler issues--in contrast to Superman, the inhabitants of Bizarro World hate Bizarro #1 because he saves them from danger, and Bizarro needs a secret-identity not so as to have a normal life, but so as not to be reviled. Bizarro Lois, in this iteration, loves Bizarro Clark and hates Bizarro #1, not knowing they're one and the same. And Eric Powell's Bizarro Dawn of the Dead-rejects swarming en masse over Superman is something to behold. This may not be the definitive Bizarro story, but it may be the most visually gripping. One more Superman collection to go, with Superman and the Legion of Super-Heroes. Join us next time! How do you want Final Crisis collected?